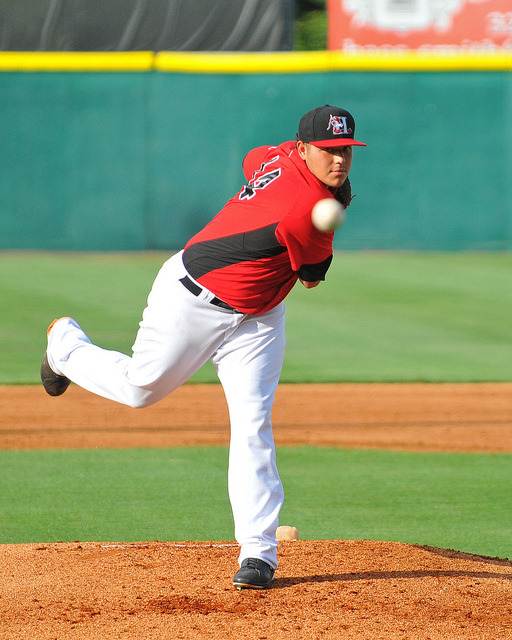 Hickory Crawdads pitcher Luis Ortiz literally brings a world of talent to the mound. Named the World Cup MVP for the gold-medal winning, 18-and-under Team USA national baseball team, the Sanger, Calif. native was selected in the first round by the Texas Rangers in June 2014. When he came to Hickory last summer, Ortiz was the first high school pitcher since 1993 to be drafted by the Rangers and then later pitch for a full-season minor league club in the same season. Those who rank prospects love him. MLB.com currently lists Ortiz as the No. 91 prospect overall in the minor leagues and the Rangers fifth-best prospect. Baseball America tabbed him as the Rangers’ ninth-best prospect prior to the 2015 season. His 6-foot-3, 220-pound frame supports an easy, fluid motion that belies the 94-96 mph fastball that suddenly springs from his right hand. Wielding that pitch along with a hard, mid-to-upper 80s slider and an occasional change, there is much to like about Ortiz. After putting up a 1.80 ERA in 50 innings with 65 strikeouts and 15 walks this season, the playoffs have truly given him a center stage in which to display his talents. 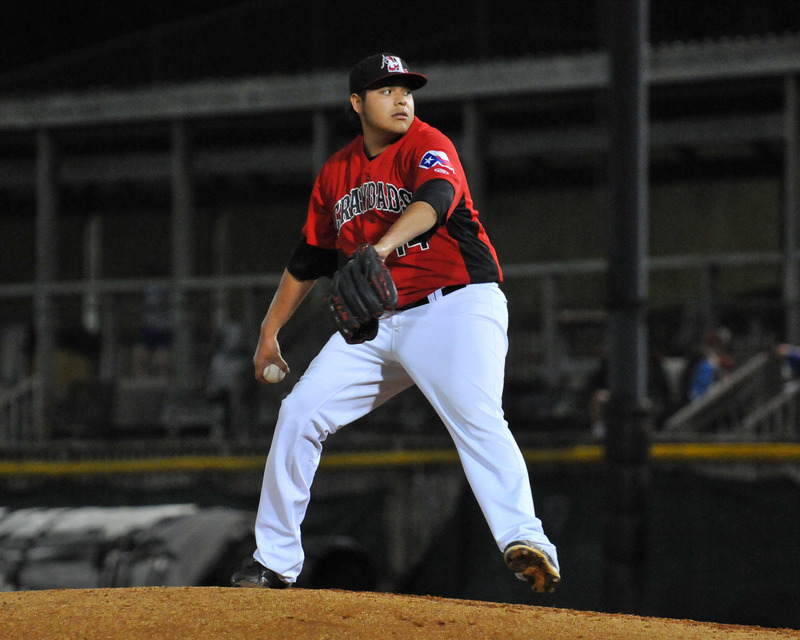 Last Saturday in a 1-0 win to clinch the South Atlantic League’s Northern Division series, Ortiz threw arguably his most dominant two innings of the season by striking out four of the six hitters he faced. His slider missed five bats and two of the strikeouts came on a fastball that zoomed up to 98 that kissed the glove-side corner at the knees. Tuesday against Forrest Wall, the number four second base prospect (mlb.com), Ortiz had Wall swinging through a changeup, fastball and slider on successive pitches. While many of his age would rightfully tout their success at such a young age, at this point, Ortiz will have none of that. When you speak with him, you quickly gauge that he has confidence in ability. However, there is a bit of his personality that gives you the feeling that he wonders what all the fuss is about. This is a humble kid and he learned that humility from his earliest days. It’s become an asset to his baseball career. Known as the “Nation’s Christmas Tree City,” Ortiz’s hometown of Sanger is located near Fresno, nestled against the Sierra Nevada Mountains in California’s Central Valley. It was this small town of raisin and orange farmers that Ortiz grew up with his siblings to a single mom and her family. With a large gang presence there in the area, and his mom working two jobs to support the family, Ortiz credited his great-grandfather Ricardo Santiago for keeping him out of trouble and serving as the male role model growing up. It was Santiago, who Ortiz said was a catcher in the Mexican League, that helped him developed his love for baseball. But it was Santiago’s work with the area’s homeless population that stuck with Ortiz the most. Ortiz also credits Terance Frazier – the founder of Central Cal Baseball Academy in Fresno – for seeing the immense talent that was there and getting him on track so that Ortiz could do what needed to be done to use that talent. The Rangers signed Ortiz away from a commitment to Fresno State for a reported $1.75 million. He had hoped to use the bonus money to put his mom into a better home, but true to her family’s humble spirit passed down from Ortiz’s great-grandfather, she would have none of it. Candaele sees a lot of that humble spirit in Ortiz. He feels that trait along with his talent will serve him well on the road to the majors. The lessons with which Ortiz grew up still continue with him nearly four years after Santiago’s death in July 2011, following Ortiz’s freshman year in high school. Ortiz honored his loved one with his first autographed baseball that was then placed into Santiago’s casket. Carrying his great-grandfather’s handkerchief in his pocket, Ortiz still looks to his great-grandfather for advice about humility. In doing so, he recalls the words of Santiago that stick with him to this day.